Sometimes getting hung up on percentage increases causes one to miss what's going on with the actual numbers. USAT's Wolf let himself get distracted by double-digit caseload increases in certain states, but missed the big story: California, with roughly 12% of the country's population, was responsible for over half of the increase in both families and recipients receiving benefits. The reason the state's percentage increase was smaller than several others was because its caseload is already scandalously out of control. Wolf also made a point of comparing the relatively small increase in the national welfare caseload to steep rises in the number of Americans receiving food stamp and unemployment insurance benefits. Welfare rolls rose in 2009 for the first time in 15 years, but the 5% increase was dwarfed by spikes in the number of people receiving food stamps and unemployment insurance. 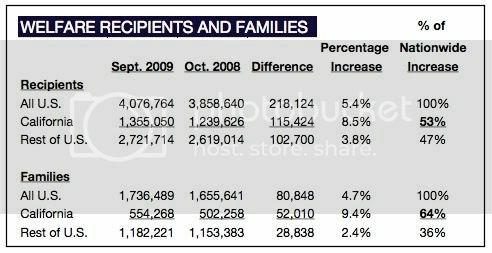 The cash-assistance program that once helped more than 14 million people served an average of 4 million in the 2009 fiscal year, up from 3.8 million in fiscal 2008. By comparison, there were more than 37 million people receiving food stamps in September, an increase of 18% from the year before. The number receiving unemployment benefits more than doubled, to about 9.1 million. The disparity has caused some of those involved in passing the 1996 welfare overhaul to question whether it's failing to help victims of the recession. "Making the rolls decline got to be a badge of honor for states," says Ron Haskins of the Brookings Institution, who led the Republican staff on the House panel that wrote much of the law. "The evidence now is that it is not a very good safety net." In the past year, some states have seen increases of 15% or more in their welfare caseloads, including Florida, Ohio, Oregon and Washington. Others have continued to cut the rolls, including Texas, Indiana and Rhode Island, according to federal data. .... Advocates for a more lenient welfare system say tough work rules, time limits and penalties in many states are blocking needy people from qualifying. Benefit levels in some states are so low that many people don't apply. "They decide the program's not worth it," says Stephanie Goodman of the Health and Human Services Commission in Texas, where the average monthly benefit is $68 per person. As you can see, California's recipient increase was more than double that of the rest of the nation, while its increase in the number of families receiving benefits almost quadrupled the rest of the U.S.
California's welfare-to-work program will allow more than one-third of its applicants to opt out of jobs and still receive checks, the governor has decided. Gov. 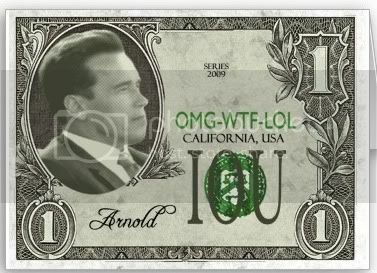 Arnold Schwarzenegger has achieved a future tightening of the rules by temporarily suspending part-time work requirements for a large share of recipients, The New York Times reported Wednesday. Single parents with a child age 1-2 and those with two children under the age of 6 are getting letters telling them they no longer have to work to collect a welfare check. The move represents a return to the welfare approach that existed before a national overhaul in the 1990s. California officials emphasize the relaxation will end in 2011. Image at top right found at Zazzle.com.